It is the act that initiates a rally in table tennis. It is the first stroke of each point. Some simply put the ball into play with a no frills, basic approach. Others vary the spin, speed and placement and use it strategically to dictate the action and induce their opponent to make a mistake. The serve in table tennis has evolved through the years as the sport has grown in popularity and rules have changed. It is interesting to note that the rules of service are one of the most often violated/least enforced rules in table tennis. Illegal serves are especially prevalent in smaller, local tournaments, but also do occur with regularity at the professional level. It is a problem that is often overlooked and it is everyone’s fault, from you the player, your opponent, to tournament organizers as well as referees and umpires. I’m not here to argue who’s to blame or who is responsible to fix this issue. The aim of this article is to explain the rules in the simplest way possible, with the use of clearly explained diagrams and video. Before delving into the discussion, let’s make a brief comparison with other sports: In soccer, if you aren’t the goalie and you touch the ball with your hand, it is a violation of the rules. In tennis, if you step on the baseline while serving, it is a foot fault and a violation of the rules. In boxing, if you strike your opponent below the belt line, it is a foul and a violation of the rules. In these examples, when the foul or violation is clearly observed by the officials, it is consistently called as such and punishment is handed out. So in table tennis, when your toss is too low (violation of the rules) why is it not consistently called and corrected at tournaments? Enough ranting. On to the explanation of the rules. Another way to look at this is from your opponent’s perspective. He or she must be able to see the ball at all times, from the time it is presented in the server’s open palm to the time the server strikes the ball. Old timers may still serve the way they used to before the ITTF changed the rules in September 2002 – the good old ‘under-the-arm’ method, that was employed to devastating effect by players such as Liu Guoliang. In a pre-September 2002 match against Jan Ove Waldner, watch these two legends serve under the arm – legal at the time, but not legal any more. The ITTF Laws on Service (2.06.05) define an area that must not be obstructed at any time: “The space between the ball and the net is defined by the ball, the net and its indefinite upward extension”. The shape described is a triangular prism. To simplify, take the ball at any time during its flight and draw an imaginary line from the ball to the two net posts. These two lines, plus the length of the net is your triangle and the area above it is the “indefinite upward extension“. Do not obstruct this defined area. So there you have it, in six easy steps. 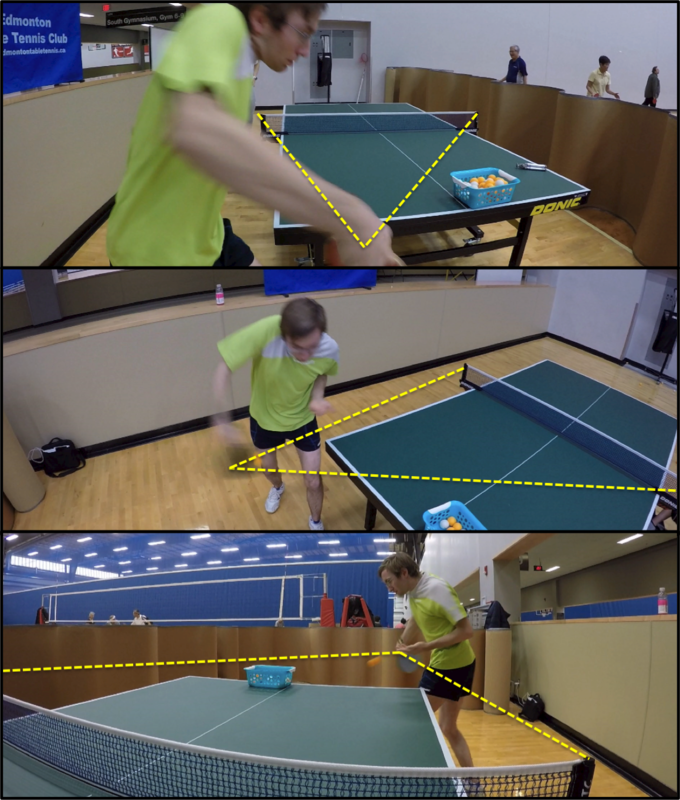 You can watch the video in its entirety at Edmonton Table Tennis Club’s Youtube channel. This article did not discuss the “why’s” of the rules of legal service. As I mentioned previously, the ITTF changed the rules for service in September 2002 to the current ones that we just went over. To get a good idea on why the rules are the way they are, check out this article at All About Table Tennis.com. If you want to see a great example of a legal serve at the professional level, look no further than Vladimir Samsonov. In this slow motion video, you can clearly see that he meets all six conditions of legal service. On the women’s side, Li Xiaoxia’s serve is a technically good serve as well. Special thanks to Coach Wang and Edmonton Table Tennis Club (ETTC) for allowing me to use the Coach’s Table to do the video shoot. Also, thanks to ETTC member Bradley Smith for taking time to demonstrate the serves. With the new year upon us, let’s make it our resolution to serve legally! This entry was posted in Technique In Action and tagged Alberta, Athletics, City Of Edmonton, Edmonton, Edmonton Table Tennis Club, Fitness, ITTF, Laws of Table Tennis, Ping Pong, Recreation, Saville Centre, Serve, table tennis. Bookmark the permalink.